This is really a sweet risotto made with Carnaroli rice, which is distinctive for its large, long grains. Kashmiri saffron is the best in the world; its graduated colour from red to yellow is a sign of its quality. Melt the butter in a pan, add the rice and cook gently, stirring, for 1 minute. Add the milk, cream and sugar and continue to stir until the sugar has dissolved. Add the cinnamon stick, saffron strands and orange zest and bring to the boil. Cover and simmer very gently, stirring frequently, for 30 minutes or until the rice is tender and creamy. Remove the cinnamon stick and orange zest. 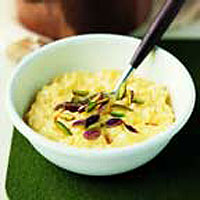 Serve warm or at room temperature in individual dishes, scattered with the pistachio nuts. Vialone Nano is another variety of risotto rice that could be used instead of the Carnaroli. Vialone Nano has shorter, rounder grains, which retain more of a bite when cooked.